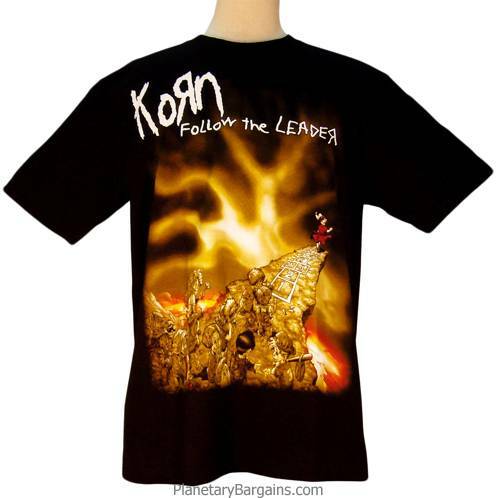 Own this 100% Cotton Korn Follow The Leader T-Shirt. To buy one of these limited quantity shirts press the orange button above now. Follow the Leader is Korn's the third studio album. The album was released in 1998 and peaked at number one on four charts, with 268,000 units sold in its first week of release, Follow the Leader is often credited with bringing nu metal to the masses. Its singles "Freak on a Leash" and "Got the Life", both showed up on more than three charts. The album mostly received positive reviews by critics. The song "Freak on a Leash" was nominated for nine MTV Video Music Awards, and won for the Best Rock Video award. The music video for "Freak on a Leash" won Best Short Form Music Video at the 2000 Grammy Awards. 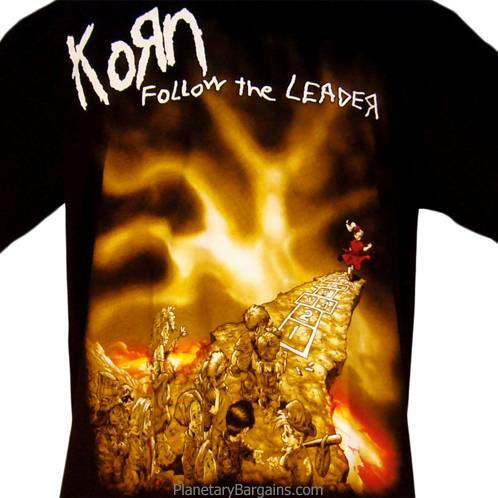 Follow The Leader is Korn's most successful album to date.